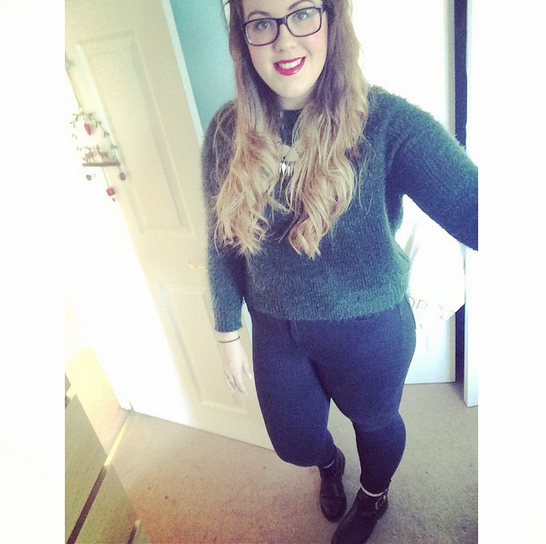 Beautiful You: OOTD | Winter Warmers! I thought that seen as my blog has been very tailored towards the beauty industry recently I thought that I would change it up and share an outfit of the day with you. I shared this outfit on my instagram a while ago and it went down quite well so I thought that you would all like to see it too! I have been loving thick woolly jumpers in the past few month because it has been really cold where I live. This one is a slightly cropped one that I managed to get in the Topshop sale for £15 and it is a really lovely forest green colour. Then I just put on my standard Jamie jeans from Topshop which I literally love because they make me look skinnier than I am which is always a bonus. I would definitely recommend these if you are looking for a pair of good fitting jeans, they are £40 but they are totally worth the money. Then for accessories I put on a silver chain necklace, a pair of black frilly socks and my black cut out boots! I hope you liked this outfit and that it has given you some inspiration for a wintery outfit, what are your favourite outfits to wear in the winter? Do you like a good jumper? Let me know in the comments below. Also if you noticed I have re-dyed the ends of my hair and I am now fully ombred, can I get a whoop whoop?! If you haven't seen I also have a giveaway live on my blog at the moment where you can win a Home Fragrance Set from House of Fraser which I will link here so you can go and enter! I shall see you all soon, have a lovely weekend. I love this jumper! It looks really comfy and perfect for this time of year! Whoop whoop! Great outfit and you look amazing! (: I'm a huge fan of oversized sweaters and huge infinity scarves during the wintertime. OH, and I absolutely love my military jacket. Something about that forest green color. Anyways, outfit looks great, hair looks great, and you look great!